A New Cooler Alaska, I wonder if the IPCC noticed | Climate S.W.A.G. The last few weeks have been chock full of climate change and environmental news. Tuesday, May 1 – Earth’s greenhouse gas approaches milestone levels. Carbon dioxide in the environment officially passed 400 ppm. This story was nothing more than an excuse to drag out all the old gloom and doom climate stuff that we all have been witness to for the last 30 years. Carbon dioxide has been steadily rising for 200 years and man is probably responsible for most of it, but if there ever was a predictable event this one was it. Tuesday, May 14 – A Washington Post story noted that the Obama administration allows wind farms to kill eagles, birds despite federal laws. Mr. Obama has decided that global climate change is more important than the Endangered Species Act. This should be interesting to watch. Friday, May 17 – The Guardian posted Obama’s climate strategy sets off climate a time bomb. The article is critical of the compromises the administration has made in the Arctic. Saturday, May 18th – Anchorage sets new records for snow and cold as documented in the Anchorage Daily News article titled Late-May snow sets multiple records. Sunday May 19 – At 7:00 AM this morning it was 21 degrees F at my house. The high yesterday was new record low temperature for a daily high by a whopping 7 degrees. Today will be the 46th consecutive day it has been colder than average in Fairbanks. 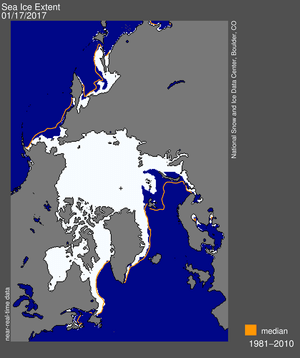 US lawsuits about the disappearing Arctic Ice will abound and will be largely ineffective because they are regional in nature and the problem being addressed in international in nature. It matters not what the USA does, if Russia, Norway, Denmark and Canada don’t go along. Recent history would indicate that actions off the coast of Alaska have had very little to do with the current Arctic Ice disappearance. AR4 (orange) was prepared in 2005 and published in 2007. Virtually every year since has been colder (the black bars) than their predicted range and 2012 continued the trend. So far 2013 has been a bit colder than 2012. So what’s going on? It does emphasize something I think I have been right about since day one of this blog. Where climate is concerned everybody with a strong opinion on the subject is guessing. I see guesses here, guesses there, guesses everywhere whenever climate science is discussed. This entry was posted in Alaska, Climate Change and tagged Alaska, Alaska weather, carbon dioxide, IPCC, tempeature data. Bookmark the permalink.